Health coverage can provide you and your family more options to get the care you need. You can go to any doctor or hospital that accepts the type of coverage, including Indian Health Services, tribal, and urban Indian clinics. To learn more about the impacts of the Affordable Care Act on American Indians and Alaska Natives check out our frequently asked questions. 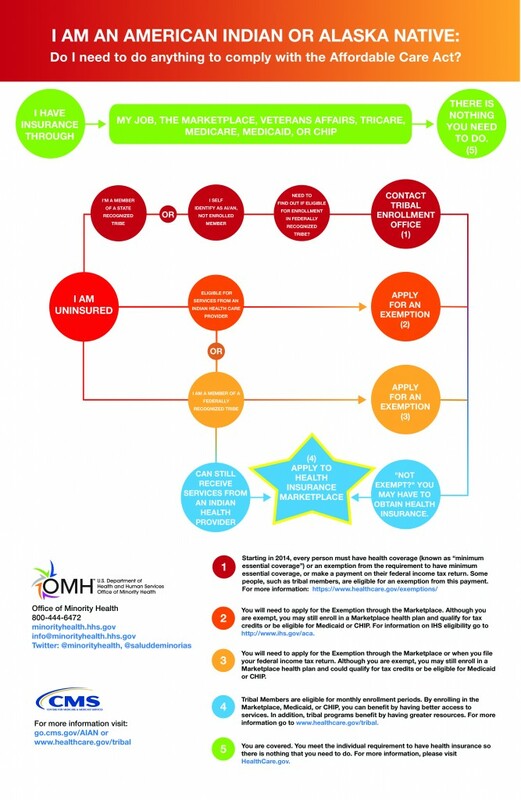 To learn more about applying for an exemption from the health coverage mandate see healthcare.gov. Health First Colorado and CHP+ are free or low cost public health insurance for Coloradans who qualify. Beginning in 2014, more adults without kids and parents can now qualify for Health First Colorado. Now individuals making up to about $1,300 a month or a family of four making about $2,650 may qualify for Health First Colorado. As an American Indian or Alaska Native, if you qualify for Health First Colorado or CHP+ you do not have to pay co-pays or enrollment fees. This means you do not have to pay your doctor for any services Health First Colorado or CHP+ covers. If you already have Health First Colorado or CHP+ but didn’t specify when you applied you were a member of a tribe, you can update your information online. Health First Colorado and CHP+ need to know if you are a member of a tribe for you not to get charged for co-pays or enrollment fees. Find out if you or your family may qualify for Health First Colorado or CHP+. To find out more about Health First Colorado and CHP+ check out these videos for American Indians and Alaska Natives created by the Centers for Medicare and Medicaid Services (CMS), Division of Tribal Affairs. Members of a federally recognized tribe can buy health insurance from Connect for Health Colorado at any time. You do not need to wait for an open enrollment period to enroll. You can also change the health plan you picked once a month. If you applied for an exemption from the individual responsibility payment, you can still sign up for coverage through Connect for Health Colorado. Connect for Health Colorado has additional information for American Indians and Alaska Natives here.